Automatically Log Off your Computer when Computer remains idle with Turn Off Monitor Utility. 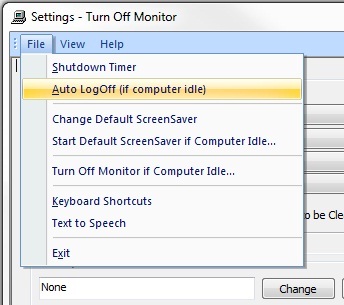 Download and Install Turn Off Monitor Utility on your Computers. Launch Turn Off Monitor Settings from the desktop Shortcut. A small window will appear called Auto Log Off. Configure idle Minutes after how much Minutes do you want to Auto Log Off your Computer by entering Minutes as displayed in above Screen Shot. After Configuring the Minutes press OK to Auto Log Off your Computer after idle Minutes. A Confirmation Dialog Box will Appear that Computer will Auto Log Off in 15 secs. 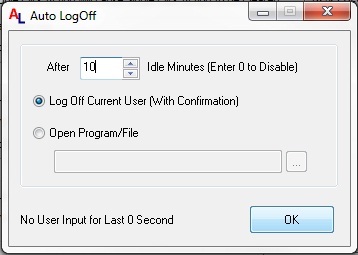 (After Configuring Minutes below Log Off Current User (With Confirmation) you can also Mark to Select Open Program File which will not Auto Log Off your Computer but you can Select any program File to do other Action after the Idle Minutes. If you have a File to Shut Down your Computer you can Open the Program File Shut Down Computer after the idle time Action your Computer will Shut Down Automatically).